"The UAC will just shift a bit towards the coast on Tuesday, and bring some rains in North Konkan". This statement was put up yesterday (Monday, 11th June) on Vagaries. 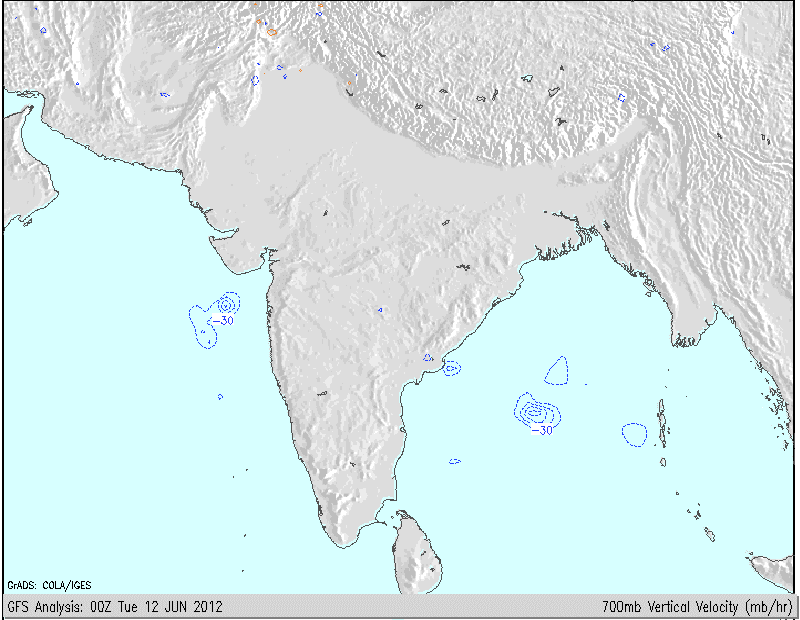 A UAC off the West coast generally plays a very usefull part in influencing and activating the Monsoon current. It was on this basis itself, that Vagaries forecasted a nominal increase in rainfall in N.Konkan and the Mumbai-Pune region for Tuesday, 12th June. And Vagaries waited for this "small" event to announce the SWM into Mumbai. But...man proposes.......the events assembled systematically thru the day on Tuesday. The 700 mb and 850 mb Maps shown below indicate a "perfect "formation of the UAC. But, the UAC just "flirted" with the region. It is apperant that the UAC will shift away from North Konkan Coast next few days...reluctantly keeping the given forecast on Tuesday's blog intact. The UAC is moving away from the coast. J-3, another WD is moving across the Northern region of the sub-continent. Induced lows from J-3 could deter the Northward movement of the Monsoon. Has Mumbai and N.Konkan missed an opportunity ? Mumbai and Surat SWM pushed off till at least Sunday, 17th June. (One more chance if an off shore trough can re charge with an embedded UAC after Sunday). Pune was cloudy in the afternoon, with thunder heads showing up in the eastern skies. In fact, there was a report of light drizzles from the outskirts (Sports city area) in the afternoon. Next 2 days will see partly cloudy skies, but warming up in the day. Light drizzling in some parts. Shitij just reports from Surat of a shower. (Vagaries had mentioned of a shower for Tuesday). Now, as mentioned, there will be a decrease in rainfall from Wednesay. Central Interior regions of Saurashtra would get some rainfall, light to medium, in a few spread out pockets till Wednesday. Mumbai woke up to sunny skies, and the clouds gathered as per the assumption, and was almost overcast by afternoon. The high and medium clouds rolled in from the South, indicating a low area (aloft) due west of Mumbai threatening rain right thru the day. No area in the city recorded any rain. (Later,subsequent to publishing this, Vagaries recorded 0.9 mms in the night). Now, we stick to the given forecast. Wednesday/Thursday/Friday sees partly cloudy skies with light rain in some parts of Mumbai. Rain amounts < 5mms. Vagaries' had already announced the advent of the SWM into S.Konkan (answer to a certain mail query) on Sunday (10th). Several stations in S.Konkan recieved good rainfall today:Kudal 110 mms, Sawantwadi 74 mms, Vengurla 71 mms and Devgad 46 mms to name a few. Due to the WD effect, even Vortices expected (pulses) from the trough in the Eastern coast might get "pushed away" further Eastwards. This will prevent further rainfall in the peneinsula regions (East) and even deter the SWM from moving into Bengal and Kolkata till Sunday 17th June at least. The anticipated vortex will form near Hyderabad as a pulse moves westwards, and bring showers to the city on Wednesday for a day. Vagaries had mentioned 2 days ago of the prospects of strong west winds shooting up Chennai's day temperatures again to 40c. Meenambakam was 40.4c on Tuesday. We can expect the days to remain around 40c for another day, before slipping back into the late 30s. Kashmir had precipitation from J-3 today. Gulmarg, almost missed out on the snow as the low fell to 2.5c (-5c) with 24 mms of rains. Several pockets in Pakistan's Balochistan and Northern Regions had the WD precipitation. Hot spots in the Balochistan and Sindh suddenly saw a drop in temperatures. As per PMD site, Sibbi, a Balochistan hotspot, saw 19 mms of rain and a low of 14.2c ! !Almost 15c below normal !! At present light rain in Surat accompanied with heavy thunderstorm. Just discovered your site today.. Will help me with the technical aspects like CVM, UTH , SST etc that I found wvery difficult to understand. @rajesh i am really sad seing th etotal change in weather yesterday it was damn hott!!! !nd tuesday si load shedding day for panvel,,it feels like hell from 6th june panvel was experiencing daily rain and cool weather wich has abruptly stopped!! even wen colaba recorded 35.5 nd santacruz 34 max ,,panvel's max that day was between 29-30 nd minimum 24-25 c,,yesterday temperatures shot up!! !wen will the next spell of rain arrive??? Pavan: The sky colour depends and relates to the moisture in the upper atmosphere. A dark blue sky shows excessive moisture in the upper atmos. Nothing to do with ground level pollution. This is used to forecast and read the weather also. 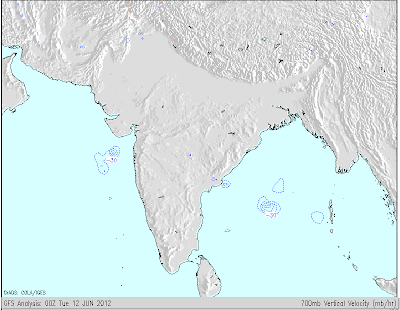 GSB: Yes, as mentioned, the monsoon current upto S.Konkan is weak. BTW where are you based ? junaid:Tried my best to get some rains in our area, but Nature prevailed over me -:)) Lets hope the next rain comes at least by Sunday as explained. Panvel has managed 77 mms till now. As no one can predict nature as you say and believe ( i read somewhere in your blog) one thing is for sure you thrive for perfection and you are doing it very nicely. @Rajesh, I am 46, male, and based in Thane, Maharashtra. By this time the monsoon usually hits Mumbai (maybe by 15th June) but this time it feels like end May or thereabouts. Not at all a June monsoon climate!! I actually fear for the water supply in Mumbai and Thane. As you might be aware they will reach critical levels by 15th JUly. i still think the "10 day precipitation outlook" forecast by is GFS looks better (favorable) than what it was in june 2009 at similar time. Pavan: when I did not have the computers, and other fast forecasting methods, even Sat images were rare, and could get them 1 day late, I managed and forecasted the weather then by visual observations. I am talking of the early 70s, 40 years back. A deep blue sky, with sharp outlined clouds means good moisture in the atmos, and less dust particles. Generally observed during an approaching low or depression, or in case of a "front"
generally indicating approaching rains, specially if clouds are alto cumulus (dotted). But a faded light blue sky, where the clouds are not prominently seen or hazed, means no moisture and rains fading away, (munmbai today on Thursday). A sunset showing deep red colouring heralds unstable weather while a plain sunset with a dull orange on the horizon shows fair weather. This is brief..can make a seperate note later if required. CA NILAY RAJNIKANT WANKAWALA/GSB : Thanks for the kind words and your encouragement. Welcome to Vagaries' family, and i do hope to receive your comments and views to give a wider outlook to Vagaries.